You might have seen them popping up in your neighbourhood. Not those eagerly awaited tulips or perennials. The beautiful white and orange basking in the early spring sun. 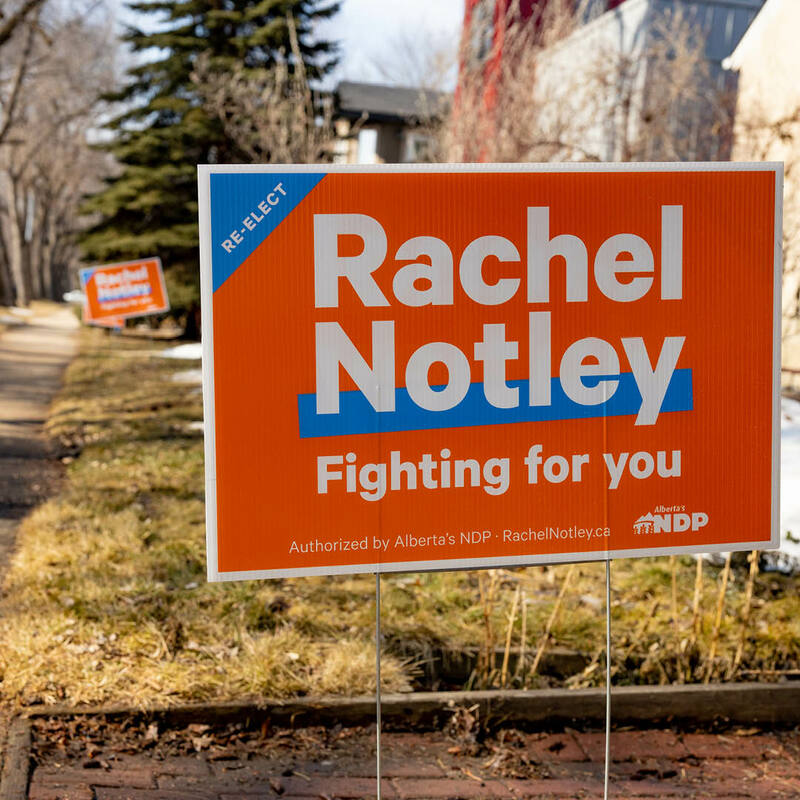 While Jason Kenney’s team is busy putting duct tape over road signs to avoid innuendo, volunteers for Rachel Notley are coming to a front yard near you. A campaign sign is a tangible way of getting involved. And of showing momentum. Thanks to the magic of the Internet, signing up for a sign is also super easy. For analogue types, you can also stop by your local campaign office and meet your team of wonderful volunteers. Signs can be tailored to the place you dwell. For apartment dwellers, balcony ties are available. And while you might have heard otherwise from a property manager, you are legally allowed to display signs on your rental property. Believe it or not, scientists have studied the effect of the humble election sign. A 2016 journal article in Electoral Studies journal compared four randomized field trials to investigate whether signs make a difference. If you’re thinking “TLDR” — or wondering what TLDR means — here’s what they found. Signs increased votes and had spill-over effects into nearby neighbourhoods. The difference was nearly two per cent, which is enough to make a difference. In a close election, the effect might be bigger than that. With Jason Kenney assuming he’s already won, a lawn sign is a way of showing your friends and neighbours that the UCP doesn’t own Alberta. The future of the province is worth fighting for. Notley says that a sign is one way of saying that Alberta’s best days are ahead.